Welcome to First Presbyterian Church! We are excited you're considering joining us for worship this Sunday. We know that it is hard to think about joining a new church and that sometimes the little unknowns can prevent you from trying something new. We hope this page will introduce you to our worship service, and help with the basic things like where to park and where bathrooms are located. Our goal is to help you find your way into our community with as much information as you need to know. As always, if you have any questions, don't hesitate to e-mail or give us a call. See you Sunday! We have no dress code and enforce no ideals about attire for worship. On any given Sunday you will see some people in jeans and a t-shirt or flannel and some people wearing khaki's or skirts. A few members even wear sport coats or dresses. Come to worship God, not to wear a fancy outfit. We are a community that has a range of backgrounds so we welcome everyone, no matter how much or how little they are dressed up. Street parking is available on Harvey Street. There is a designated Handicapped parking place in front of the church. 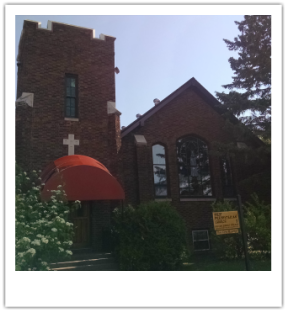 If you would prefer not to walk up the stairs, our elevator can be found around the back of the church accessible from the alley. When you come in, hosts will meet you to be sure you have an order for worship and anything else you need for the worship service. Our sanctuary does not have reserved seats, so sit anywhere you like! If you have small children, they might benefit from sitting closer to the front so they can see all the wonderful symbols that are a part of our worship. Wherever you sit, you'll be next to friendly faces who will introduce themselves to you and welcome you to our congregation. A family-restroom is located near our "coffee area" on the same level as the sanctuary. It is handicap-accessible. We also have restrooms located downstairs in our social hall near the coat rack. WHEN DO I STAND OR SIT? When you come to worship you will be handed our weekly order for worship. This bulletin tells you everything you need to know to participate, including notes about when to stand and when to sit (look for the *). Pastor Corey also provides instructions throughout the service, so have no fear, you will not be left behind! Occasionally, our order changes, but most weeks our worship looks very similar. We follow a traditional Reformed liturgy but we try to fill it with life, exuberance, and conviction. Each week our phenomenal music director leads us in a wide variety of hymns and other selections. On the first Sunday of the month, we celebrate the Sacrament of the Lord's Supper, and everyone present is invited to join in the feast. Come and worship with us!